For assistance in designing your pier, or to get help on putting together a parts list CLICK HERE to e-mail Aqualand direct. You will receive a reply within 24 hours Monday Through Friday. High quality stands provide the support for your do-it-yourself pier, in the width that's right for you. A special stand is required if you pier plans call for either an "L" or "T" configuration. A third leg is used to create either an "L" or a "T" section on your new pier. Anchors your pier securely to the shoreline. Deep water bracing is added to piers that are in deep water. They are designed to help eliminate swaying. Designed for the do-it-yourselfer who want to build a wooden framed pier. 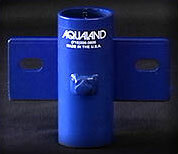 The Aqualand E-Z Bracket is designed to work with1 1/2 inch pipe, and is plenty strong enough to supports up to 2 x 6 wooden beams. The Sta 'N Place base pad is another exclusive Aqualand feature, a fully adjustable pier leg base which stays put all season long. No shifting and no continuous adjustment. Install it once and be done.